A non-judgemental look at the way religion and spirituality has impacted the history and dynamic of our community. Speakers and Discussion leaders: Rev. Neil Cesares-Thomas, COH; Dr Steven Sprinkle, Brite School of Divinity, TCU; Rev Carol West, Retired, Celebration Church; further speakers to be announced. Sponsored by Cathedral of Hope and AARP. A Roundtable Discussion on the history of the Black LGBT Community in Dallas. Join us for a conversation about the history of the Black LGBT community in Dallas, presented by The Dallas Way, and hosted at the African American Museum of Dallas. A panel of leaders and members of the Black LGBT community, facilitated by Candace Thompson and Byron Proutt, will tell their stories and share their insights into this important piece of Dallas history. Additional panelists will be named in subsequent updates to this post. 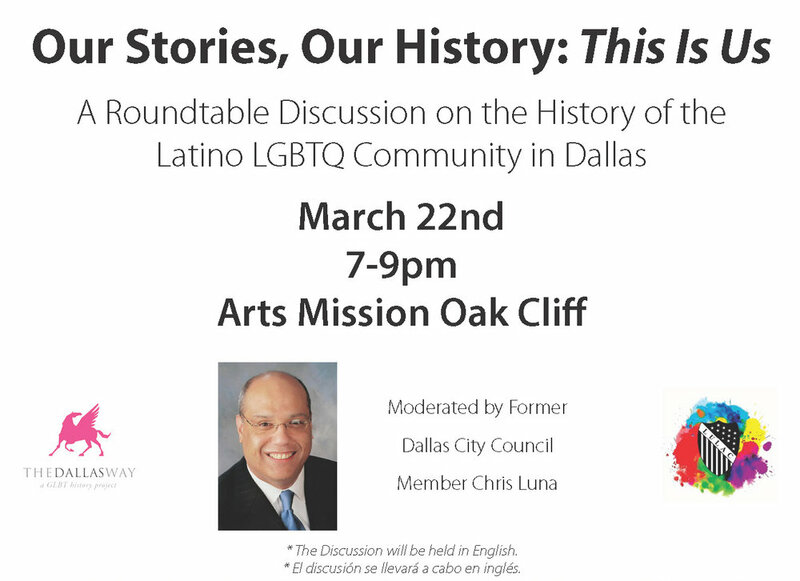 About the series: "Our Stories, Our History: This is Us" is a new roundtable series of The Dallas Way, focusing on traditionally underrepresented stories and histories within the LGBT community of Dallas. Through discussion and intentional organizational partnerships, we hope to expand the collection efforts of Dallas's LGBT history to be more holistic and inclusive of all voices and stories with the community. The one-hour reception will include the unveiling of the Pride Flag, signaling the beginning Pride Month in Dallas. Light refreshments will be served. UNT Special Collections and the UNT Pride Alliance are pleased to present a screening of the film After Goodbye: An AIDS Story as part of a semester-long collaboration dedicated to programming related to the impact of HIV/AIDS on the LGBTQ+ community of Dallas, Texas. This Emmy-winning documentary produced by KERA examines the impact of AIDS on the Turtle Creek Chorale, a men’s chorus based in Dallas, which lost more than 90 of its members to AIDS at the time of film production, and nearly 200 as of today. The film explores how the Chorale banded together to navigate grief and acceptance through music. Join us at 6:30pm in the UNT Gateway Center, Ballroom 34 for cocktails and hors d’oeuvres. The film will begin at 7pm, and members of the Turtle Creek Chorale A Capella group Camerata will perform throughout the evening. We invite you to join us after the film for a Q&A session. Kathleen Hobson-Bond, Director of the UNT Pride Alliance, will moderate this discussion. Related events: How to Survive a Plague (part of the Doc Spot Film Series) on November 29, 2017, and the ongoing Threads of Remembrance exhibit in UNT Special Collection (Willis Library Room 437). The exhibit will remain on display through December 15, 2017. Join The Dallas Way for a performance of "Hit The Wall" at Water Tower Theatre on August 16h at 7:30PM. TDW guests can purchase discounted tickets for $22. To obtain the discount, call the box office at 972-450-6232, and tell Kayla Freeman you are with The Dallas Way. The show follows a diverse group of young people as a joyful evening at a gay nightclub, following the death of the iconic Judy Garland, is brutally interrupted by a police raid that touches off days of violent protests. Hit the Wallpremiered in 2012 at Chicago's famed Steppenwolf Theatre. Hit the Wall transports audiences to the Stonewall Riots in New York's Greenwich Village on June 27-28, 1969, when a routine police raid on an underground gay hotspot became a foundational moment for the modern gay rights movement. Featuring a howling live rock band that evokes the era's proto-punk music and fast-paced, sharp dialogue, the vivid theatrical re-imagination focuses on ten unlikely revolutionaries, each claiming in turn "I was there." Hit the Wall is recommended for mature audiences only due to adult content and language.